Kenya Commercial Bank (KCB) is the largest bank in Kenya, offering the widest service coverage. In fact, they have expanded beyond Kenya's borders. There are now branches and ATMs of the Kenya Commercial Bank in Tanzania, Uganda, Sudan and Rwanda. The two other main banks in Kenya (who, contrary to the KCB, are subsidiaries of British banks) are Barclays and Standard Chartered. Within Kenya, KCB now has 119 branches and hundreds of automated teller machines (ATMs), which you can locate through their online branch and ATM locator. Besides KCBs own teller machines, customers can also access their funds through any Pesa Point ATM. 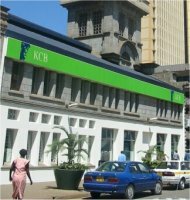 In 2009, the KCB upgraded its entire computerized banking system, which will modernize and improve services to its nearly 675,000 accounts. The change has so far not caused too much disruption other than requiring all customers to change their account numbers, and have new bank books or cheques issued. While the name implies that they are especially geared towards companies, they in fact offer a wide range of personal banking services. Customers can choose from several savings accounts, depending on their banking needs. There is even a Sharia-compliant account (interest-free) for the Muslim community (about 10 percent of Kenyans are Muslim). Personal loans are also available, as well as short-term salary advances. Partnerships with Western Union allows for money transfers from most KCB branches. Credit cards are also issued through the Kenya Commercial Bank, including internationally recognized Visa and Mastercards. KCB has banking services for small or new businesses, as well as for large corporations. Business bank accounts, loans, financing, foreign currency exchange, and money market products. Banking services for institutions, like churches, school and government offices is also part of KCB's business. Savings & Loans is actually a mortgage financing company, and a subsidiary of the KCB Group. Their website offers a mortgage payment calculator, as well as application forms for download. The KCB Foundation is a registered charitable organization, created in 2007 to support a number of social and community-based projects. Their programs include education, health service, environmental action, assistance to small business entrepreneurs and support of children's sports. The Bank is also a regular sponsor of the Kenya National Rally Championship, a cross-country motor sport race. KCB is a publicly traded company on the Nairobi Stock Exchange.